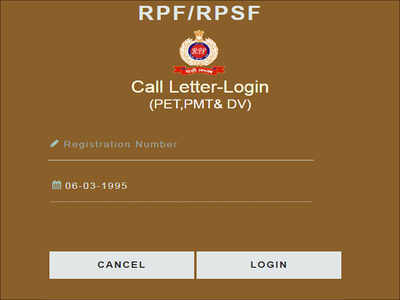 NEW DELHI: The Railway Protection Force (RPF) has released the Constable PET / PMT second round Admit Card for Group B, F and Group E.
The RPF Group B, F and Group E Admit Card for second round has been released on the official RPF Constable Recruitment website – constable2.rpfonlinereg.org. Candidates who have cleared the CBT exam can now download their admit cards for PET and PMT at constable1.rpfonlinereg.org through candidate login by entering candidate registration number and date of birth in DD/MM/YYYY format. Candidates should note that no admit cards will be sent through post. The RPF Constable Physical Efficiency Test (PET) exam dates for the for Group A, B, F and Group E second round is in first week of April 2019. Candidates, who have qualified and secured marks in the merit list in the CBT will now have to undergo Physical Efficiency Test (PET) & Physical Measurement Test (PMT) and Document Verification (DV). The second round of PET/PMT is being conducted as there some seats are still left vacant after the first round.